Across the country, children are learning the lessons that will shape their futures. 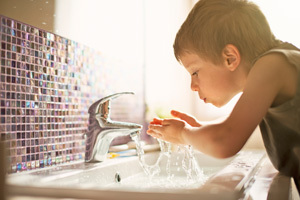 But half a million kids in the U.S. have elevated levels of lead in their blood—likely impairing their normal brain development, contributing to learning and behavioral problems and lowering their IQ's. No American community is more familiar with this crisis than the residents of Flint, Michigan. As contaminated water flowed from their faucets, an entire country watched in shock—appalled that this could happen in today's America. But we don't have to stand by in silence. This is a problem that needs to be solved now. Tell Congress: Enough delay. It's time to address the Flint lead crisis, and act to protect all Americans from lead. In modern America, no parent should have to worry that their child may be lead poisoned. But half a million American children have elevated levels of lead in their blood, and months after the lead disaster in Flint began, the community is still waiting for the problem to be solved. Please act immediately to address the crisis in Flint by funding relief, establishing school and childcare lead testing programs, and appropriating funds for the childhood lead poisoning prevention program. And make sure to protect families across America from the threat of lead pipes by reauthorizing and bolstering national infrastructure funds like the Drinking Water State Revolving Fund--and not at the expense of other important environmental and public health programs. There is no safe level of lead exposure. Lead impairs children's normal brain development, contributing to learning and behavioral problems and lower IQ's. Flint's crisis has undermined its children's potential . Please solve the problem immediately, and ensure it never happens again. Our families and communities are counting on your leadership.